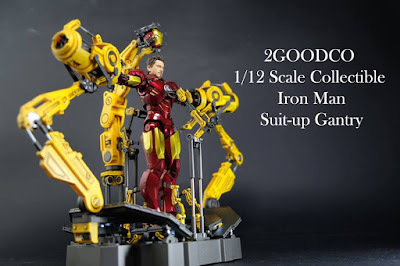 Here is a video review of the 1/12 scale Iron Man Suit Up Gantry from the company 2GOODCO (2 Good Company) this is positioned to fit into any 1/12 scale figure especially your S.H. Figuarts Iron Man line. Parts include respective arms and also a light up platform. Price starts at 110 USD. Check out the video review after the jump.